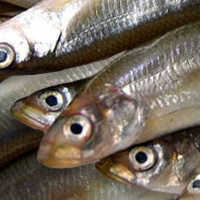 Japanese smelt also known as chika is species of smelt fount in northern Japan that resembles the Japanese pond smelt. It is caught in spring between March and May. Uses for Japanese surf smelt include being boiled in soy sauce, fried in batter, and eaten with tempura. The calories in Japanese Surf Smelt per 16g(1fish small edible part) is 14 calories. Japanese Surf Smelt is calculated to be 88Cal per 100 grams making 80Cal equivalent to 90.91g with 3.12g of mostly protein、0.1g of fat、0g of carbohydrates in 16g while being rich in vitamins and minerals such as Vitamin B12 and Niacin.